The curved, or “crooked,” knife is an old tool still used by contemporary carvers. The knives were used for shaping masks, boxes, trays, tubs, harpoon shafts, bows, arrows, boat frames, and many other items. With its curved edge, a mellgar can sculpt grooves and concave interiors as well as flat or convex surfaces, and the sharp tip lends itself to the carving of fine details. The blade is scrap metal or a piece of steel knife or file. It is lashed to a handle made of wood, bone, or antler. Virginia Minock: Tua-i taun mellgar. John Phillip, Sr.: Qupsuutii. Uumek tua waten murak waten kapuskumku, tua-i-ll’ ayagtelluku caqirrngiinaqan uuggun alularluku. Tua-i-llu makunek kangirai cali miklicarluki. Wani-wa-gguq mellgar. Virginia Minock: He uses this [pointed] end to split the wood, a certain kind of wood, but he has to drive it, to make sure it doesn’t [wiggle]. John Phillip, Sr.: Cali-llu aipaa natkeg atran aipaa canassuun. Neva Rivers: Qagkukmiutun makut canassuutet. John Phillip, Sr.: Canaluteng waten. Pingqertua wii makucimek. Neva Rivers: Yes, imkut curly-rluteng. John Phillip, Sr.: Qanermiarkiurluni canaluni. Makut maa-i qayaliaqameng tamiin atulriit qayar aklukiurquni anguarucikuni aturluni, tua-i cali-llu makuicunateng angutet. Virginia Minock: It’s an important tool for men. John Phillip, Sr.: Taugaam wani makunengrat-ggun cavignek wii tua-i makunek tanglangellrunga ciuqliitnek. Atutunillruit imkunek tegalqunek-wa tam’ ii-i. John Phillip, Sr.: Ii-i, tamakunek. Tamakunek pitullrunilarait makutaitellrani. Joan Hamilton: Metal is a trade thing, afterwards. This is a recent one. After contact, they started using these and before that they used slate. Aron Crowell: Beaver tooth, also. The beaver tooth I think has a curved edge like that. Joan Hamilton: Augkut-mi paluqtat, keggutaitnek-qaa aturlallruut-llu. John Phillip, Sr.: Pilallrullilriit-wa tua-i tamakunek-llu avani calissuutaitellermegni. Taugaam wii angumanrilamki nalluanka. (They probably did back then when they didn’t have [metal] tools. Joan Hamilton: He became aware when these were around [metal bladed], makungqelratni taugaam [only when they had this kind]. John Phillip, Sr.: Wiinga paluqtalegmiungunrilama. Taugaam tua-i aturnilarngatait tamakut paluqtaat ipgata. John Phillip, Sr.: Makut-wa tulimaulriit. Tulimaneng makulilallruit asveret makuitneng augkut wiinga tangvalallrenka. Wii pingqertua asvermeng rib-aanek makuciqa. Neva Rivers: Iquit ukut ayuqsuicugnaqut ilait ukatmun ayuqetuciquq. Joan Hamilton: They made different shapes over here [handle end]. Neva Rivers: Ukut-llu atutulqait imkunun qayaq imkuraqamegteggu, keluut maani repair-atuken elpet, matarciaqamatamakut string-at imkut atulteng itru [ ]. John Phillip, Sr.: Tulimat iquitneng-llu pililartut waten ayuqellrianeng wangkuta. Wii pingqellruunga ilaarturcuutmek qayamek waten. Ilaarrtursuutnek pilallruit. (We make ones [handles] that look like this made from the tip of the rib. I had one for patching kayaks like this. They used to call them ilaarrtursuun [tool used for patching]). Neva Rivers: Ataam elliqatamegteki uumeng cal’ aturluteng stitch-at imkut avaggun piluku uumeng cal’ aturluteng antaqluki [when they are going to put it (the kayak cover) on again, they would use this and do the stitching using this and also to take it (stitching) out.] Use this one and go through the same stitch [hole]. This is very useful one. And the ones that I know of, my papa’s, it’s shaped up like that. Neva Rivers: Rounded, yes. And he used it unarcimeng piaqami [when working on straight-grained wood]. Wedge-ameng pirraarluku kaugtuqarraarluku nutaan-llu taumeng piluku unarcineng piaqami [after using the wedge and after hitting it, then do it with that one when he’s working on straight-grained wood]. He used that [handle end] for his thumb and forefinger to be protect it, because it [the fingers] will lead this one [the handle] not to go by other way [crooked], but this one will protect it. Neva Rivers: Guide it. This way, this [the split] will be [straight], maliggluku qupiaqan [follow it when he is slicing it]. John Phillip, Sr.: Wiinga-w’ tua-i atulallrukenka tamakut. Maavet wani teguqerrluku tamakut unarciat ciumek wani qupuurqerlarait augkunek aitautneng aturluteng miklicarluteng. Nutaan-llu mikliriata una aturyugngarian aturluku qupurissuutekluku. Neva Rivers: Uumun aturluteng [using that (the curved blade)] they made little kindlings [wood shavings], made sure that they make it real small. And when their [pile of shavings] was big enough, qipluku [twist it], imgulluku [wrap it up]. And they use it for the fire-bath [respirator]. Neva Rivers: Cavilqaat. Tau taumeng wii atutullrat tangtullruamki qaygimi uitatullruama arnaungerma tang wii qanerrcigatellruunga. John Phillip, Sr.: Iqmiuciquni tua-i wani-w’ una ilua aturciquq. Neva Rivers: You have to use the thumb in here [on the concave surface of the curved blade], mikcuarauluku piukunegteggu [if they want to make a small one (hollow)], because I’ve seen my grandfather. My papa and my grandmother tell story about this kind [of tool]. Joan Hamilton: You can guide the depth with your thumb and finger. And that way you can guide how deeply you’re carving. Neva Rivers: Camun cal’ atutullratki, aimegtessutekluki-gguq atutulqait-llu makut nuyanun, angutet aimegtaqamegteki. John Phillip, Sr.: Ipegcetqapiarrlainarluteng makut aturyaraugut. Ipgailkuni canallra assiiciiquq. Taugaam ipegterrlainarluku. Joan Hamilton: Qavcitaaqerluci ayagnirluci makucinek aturyuumallruyiiceci? John Phillip, Sr.: Wiinga-wa piugngariama naspalalallrukenka. Tangvag. Waten qanrutlallruatnga, “Murilkelluten yuukina. Calilriit-llu murilkelluki yuukina.” Taluliyaurcama tua-i makuciq aturluku pilangellruunga. John Phillip, Sr.: Allrakunka tang nallukenka. Tuani aipaagni twelve, taum nuniini pingataqlalria. Allrakuuput naaqevkenaki wani calituryaurtelluukut allrakuq ataneqevkenaku. Piugngariaqami yuk caliyugngariaqami avani calitullruuq. Joan Hamilton: What they did was at first they watched, and then once they think they’ve learned enough, if they have somebody teaching them, then they’ll try on little things, hone their skills. They didn’t pay attention to age, instead they paid attention to skills development. John Phillip, Sr.: Waten qanrutlallruitkut, piugngarikumta caliar, ca aturyugngarikeput piugngarilia ayagnirluta calilaassqelluta. Caliarput ikiungermi cangaituq assiriinarciquq. Munariinarluta. Joan Hamilton: Epleneng-qaa nallunrilluku piugnarilleq, wall-uq angayuqarpet nallunirluku? John Phillip, Sr.: Tua-wa piugngaricirput tangerrluku ellimelaqaitkut. Waten qanruyutetangqertuq yugni wangkutni. Yuk wani piugngariaqan tua-i ayagnirluku cangnatuussqelluku piugngarillemtenek ayagluta. Tuaten qanrutlallruitkut. Neva Rivers: Piugngarillra [when he is able]. Like they say they’re old enough, wangkuta-llu piugnariluki [we say they are able to] in our own language. Joan Hamilton: They never told you that you couldn’t learn anything, you couldn’t do anything. 1. 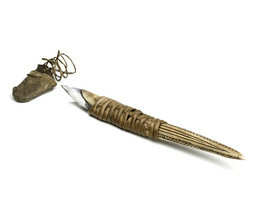 A mellgar is a “knife with a curved blade used for carving” (Jacobson 1984). 2. Mellgaq is the word for mellgar “curved knife” in the Hooper Bay-Chevak dialect of Yupik. 3. Canassuun “curved knife” literally means a “tool used for carving wood” (Jacobson 1984). 4. The verb base mangag- means “to bevel the edge of a skin for sewing” (Jacobsen 1984). Alaska Natives had crooked knives with metal blades from before the time of direct contact with Western explorers and traders. Captain James Cook, who met a group of Yup’ik kayakers in Kuskokwim Bay in 1778, wrote that: “They appeared to be wholly unacquainted with people like us, they knew not the use of Tobacco, nor was anything foreign seen about them, except a knife may be looked upon as such.